I had to use quite a bit of gel and even then the web didn't stay down very well around the edge of their faces, but it looked awesome on top. My 7 year old said he was very popular that day at school :). Thank you Sweet Sugar Blossoms for the fantastic idea! 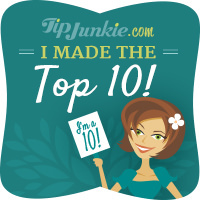 I linked up to Tip Me Tuesday at Tip Junkie.